Editor’s Note: Today I’m happy to release the second guest article for keithburgun.net! This piece is written by lead artist at Dinofarm Games, Blake Reynolds. Frequent visitors might also know him from the Dinofarm ART BARN articles or from the Game Design Theory Podcast, where he’s a regular. Enjoy! I know I’m late to the party, but considering the subject matter, I suspect many have already left anyway. 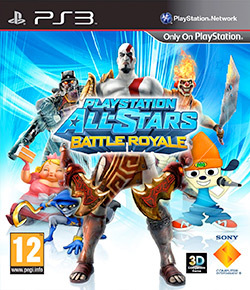 The party I’m talking about is a rousing discussion about PlayStation All-Stars Battle Royale. I think the reason so many have departed is because the game was boring and forgettable, but many of these people might not have a full grasp as to what made it so boring and forgettable. Those who are still playing and are trying their very hardest to like or justify this product won’t last much longer, and I’ll explain why. Most of the flak this game has caught in the past number of months has been quiet little suggestions that it is, well, a little bit similar to Super Smash Bros. It has features such as Smash Attacks like SSB, directional tilt-attacks like SSB, rolling like SSB, air dodging like SSB, blocking like SSB, double jumps and recoveries like SSB, “A” attacks in four directions on the ground and four in the air, “B” attacks in four directions, grappling from SSB, projectiles like smash, spiking, items… you know… every single mechanism to the last minute detail. But plagiarism is not actually the point of this article. A game can technically be a ripoff of another game and still have longevity, if it’s ripping off something really good and keeping what made the original thing good intact. The point of this article is to explain why will nobody be playing PlayStation All-Stars next year, yet even Super Smash Bros. 64, the oldest game in that series, is still going strong. The reason this game will be forgotten in another year is because of what they changed, not what they stole. They changed the very goal of the game to something completely unrelated to the mechanisms of Super Smash Bros, and yet kept every single other mechanism from the game intact! This severs the mechanisms from the core of the game engine, like yanking the nucleus from a cell, utterly destroying its purpose and identity. For those who don’t know, in PlayStation All-Stars, the goal of the game is no longer “knock the opponent out of the ring”. It is now “fill up a meter, and then use a Super Move to kill your opponents”. That this new rule is a problem should have been obvious to all of us. If we were thinking about game design in a useful way, it would have been. We don’t, though, and so this crucial point was largely missed. Most complaints from big reviewers are perfunctory and pedestrian. Here are a list of “negatives” from GameSpot’s review. Some stills and a bit of voice-over do not make for a compelling character narrative. The first two that sort of distantly address gameplay are so vague they communicate nothing at all. The second refer to features in the software, and not the game, which renders them completely useless when it comes to a discussion on game design. Again, this reviewer feels how bad this game is, but isn’t quite able to state the reasons. As mentioned in the introduction, there is a prevailing reason, and that is the severing of the core of the game from its mechanisms by changing the goal and nothing else. Have you ever found yourself watching a film, and it seems relatively well-made, well-acted, and should be entertaining on paper? Have you found that, for some reason, it just feels drawn out, tedious, or just plain boring? This is generally due to the mishandling of, or the sheer lacking of a controlling idea. A controlling idea, in short, is a very powerful prevailing value revealed at the climax, a prevailing value which all scenes leading up to contain in some way, either directly or indirectly, to support this core at the climax. It’s the nucleus, and in a good story, the threads of this nucleus run through every single scene and character. The reason this is so important is because, if too many superfluous scenes occur, if too many tangential themes or ideas are introduced, if too much gratuitous action or violence occupies screen time, we begin to feel a crushing sense of bleakness. “Why do I care? Why am I watching this? Does this fictional world make sense to me anymore or do I have any stake in it?” Engaging with the story becomes futile. To illustrate this point, I’ll use a famous and popular example, and break down how one character’s actions are woven into the controlling idea for the entire film, and echo back to your unconscious mind when the climax is delivered. The Empire Strikes Back’s portrayal of Darth Vader is actually very subtle and careful, and is tied to the climax every step of the way. He’s not just a “bad guy doing bad things for two hours.” I’ll give a quick rundown of the major events in his arc, and reveal how it all pays off in a holistic way at the climax. The word “obsessed” is used. It’s a very strong and somewhat strange word, but the viewer assumes it’s revenge-driven for Luke having destroyed the Death Star in the previous film, and that his name has become famous for doing so. Vader makes specific reference to Skywalker, and again, the viewer assumes it’s because he’s priority target #1. Against the advice of his admiral on the likelihood of this system being special, he insists. 3. He throws a very irresponsible amount of Imperial resources at one ship. He’s after the Millennium Falcon, and doesn’t care how many trained imperial officers have to die, or how many expensive Star Destroyers need to blow up to asteroids. This is strategically and professionally very stupid, and an excessive use of resources for a single target. 4. He protects Luke when the Emperor calls him an enemy. ”He’s just a boy.” “But if he could be turned, he would be a powerful ally.” are things Vader says in Luke’s defense. 5. Vader and Luke fight, and Vader can easily kill him, but doesn’t. He’s toying with him/trying to turn him evil. The climax is revealed, and Vader is Luke’s father – now everything makes sense. All of these threads which run through every single scene Darth Vader is in makes sense. It is established after the climax he can make telepathic bonds with those close to him and the force, which explains why he was so sure “Skywalker was with them” on Hoth. This is why he was protecting him, and why the word “Obsessed” was used. This makes the revelation have impact. It’s not just a shallow twist. The information is woven throughout the entire story. This means all the time you spent with Vader has meaning. The climax, where all of the plot threads finally come together. Games work the same way, in that the mechanisms of the ruleset need to be tied inherently to, and be in direct support of the win/loss condition. Otherwise, like a bad story, your actions are rendered pointless, boring, and ultimately futile. Super Smash Bros. 64 is a great example of a game whose mechanisms, though not perfectly, are tied impressively to the goal, creating a strong core of gameplay. Here’s a chart I made that attempts to illustrate this concept. At its core, SSB is about positioning, and using your positioning to gain tactical advantage and knock your opponent off the stage. The opponent must use his positioning to prevent this from happening. So, the attacker and the defender both have a set of mechanisms to meet the win/avoid the loss condition, which is to be launched off of the stage. The attacker can attack directionally, investing in more risky, long attacks to knock the opponent farther away, and the defender can exploit this by evading the long attacks and punishing the recovery time. The attacker can attack from the air, and whack you downwards over the sky, getting a “spike” which can potentially grant an early kill. The defender has a double jump and directional influence to “juke” the attacker to avoid being spiked, or even to turn around and spike the would-be spiker. When the attacker launches a defender far, the defender uses those multi-jumps to recover back onto the field, but is vulnerable to continuation attacks, as he is closer to the edge. Since he’s coming back onto the stage, he has less of the “positioning” resource than the guy who’s on the stage waiting for him. The defender, already equipped with a second jump, can execute a “recovery,” which is often a third jump and counter-attack combined, making such “finishers” risky for the attacker, as he needs to be in the air, off the stage and at risk himself, to seal the deal. The list of interactions is extremely deep, like in any good game, and therefore it’s impossible to completely map out all the possible interactions. The important thing to understand is that nearly every mechanism in the whole game is tied directly to the win/loss condition – knocking the other guy out of the stage. Nothing feels futile. Everything makes sense. Well, not everything. The game isn’t perfect. Items, blocking, throwing and stage hazards/unfair stage geometry are probably the weakest elements of the game, precisely because they don’t tie as strongly to the core of positioning. They could probably be eliminated altogether, with some re-design work to compensate for their lacking. This (coupled with the randomness, of course) explains why most serious players turn off items and only play on two or three stages. The point is, Super Smash Bros. 64 is an excellent first stab at a system that is a fresh design from the ground up, with a win/loss condition threaded strongly to most of its gameplay mechanisms. This is why learning the possibility space, attaining virtuosity and getting a deeper understanding of what it is to excel in the system is rewarding, nourishing and exciting 16 years later. Go back to the list of events for The Empire Strikes Back. Read each one and get ready for the climax. 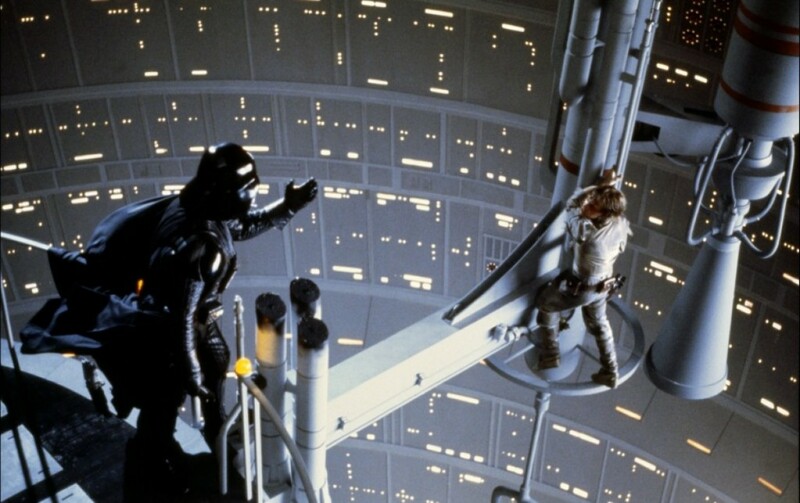 Then, take the famous “I am your father” climax, and replace it with the exploding shark climax from JAWS, but change nothing else about The Empire Strikes Back. Now, all the subtle behavior of Darth Vader, all the small decisions he’s making that spark intriguing questions, it’s all futile. It makes no sense, and actually goes from being interesting to frustrating. The viewer’s time has been wasted. As you can see, the chart is virtually identical to the one from Super Smash Bros. But take a closer look. There are no “knockouts” anymore as a win condition, but all the mechanisms to get knockouts and avoid knockouts are intact. Look at the guy getting “spiked”… into the floor. Look at the guy doing a “recovery jump” away from a wall from which he never needed to recover. Look at the obstacle ricocheting the defender. Where this might have saved his life or set him up for a lethal juggle, it now has no tangible gameplay function. And after all this, what is the win condition exactly? Oh… the win condition is similar to the worst feature from Smash Bros. Brawl: The Smash Ball mechanism. 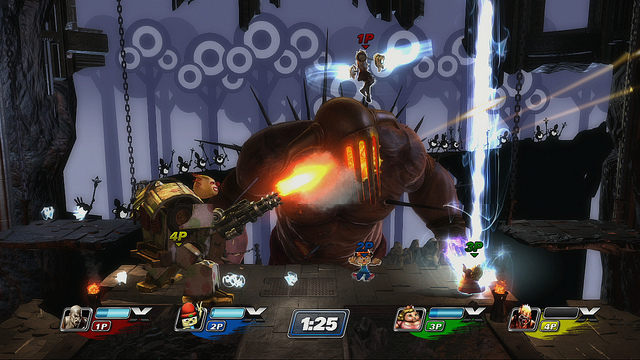 The Smash Ball is a super move that covers the whole screen, that all players put their controllers down for, fold their arms, and wait for the game to resume. In All-Stars, that is the only way you can win! And, like in Brawl, it renders every other mechanism nonsensical, incoherent and futile. Luckily, in Brawl, it can, and absolutely should, be deactivated as fast as you can navigate to the menu. Ironically, though it’s not exactly the same in terms of how to get this super move, the thing they “changed” is yet another mechanism ripped off from SSB. It happens to be the worst mechanism in all three games, and is slapped on the end of a stolen and unrelated system as the win condition. Why weren’t there riots? Why isn’t this common sense to not only game consumers, but game-makers? Honestly, I would prefer it if they had just unapologetically ripped off SSB. At least then it would have had a chance to be a modern alternative to Brawl with some of the imbalances from SSB 64 and possibly Melee fixed. Someone at Sony had to get froggy and attempt to make a game design decision. I hope this article illustrates the bottomless depth of incompetence that is PlayStation All-Stars. Most importantly, those still lingering at the party, trying to extract some value from this broken system can understand why they can’t, and that it’s not their fault. I hope this illustrates further that we should have zero confidence in what is considered to be a AAA studio full of “professional game designers.” It’s squirrels finding nuts in the dark, and has been all along. Super Smash Bros. 64 happened to be one of those nuts. It was lightning in a bottle, with plenty of blemishes, but they still got a few things really right. In the future, when we have functional game design theory in the same way we have music theory or the principles of the craft of story today, we won’t need to rely on these somewhat random moments of inspiration. That’s not to say that there will ever come a day when there won’t be bad things getting made, but it is to say that when we do fail, we’ll be able to point to why.